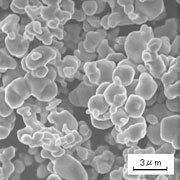 Molybdenum Powder｜JAPAN NEW METALS CO., LTD.
Molybdenum is mainly used for specialty steel, in addition, its high melting point and high conductivity properties allow it to be used in diverse applications including semiconductors and electronic devices, etc. High quality molybdenum powder with purity over 3N. Particle size can be modified based on your request. 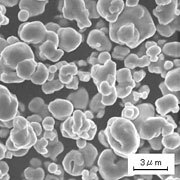 Ceramics metalization, wiring material for LCD and raw material of specialty steel, etc. 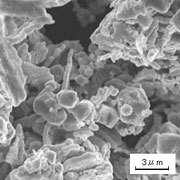 This type of powder has uniform particle with narrow particle size distribution in comparison to the standard type of powder. (*2) Molybdenum powder is a restricted item by Japan's export control regulation.